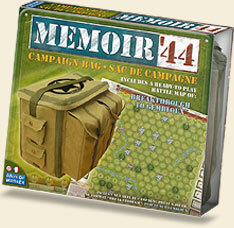 The official Campaign Bag is the definitive storage and travel solution for the Memoir '44 Game System. The Memoir '44 Campaign Bag is specifically designed to accommodate even the most demanding Overlord player, and will hold up to 2 complete copies of the board game, plus all current expansions; or a single copy of the game with all its expansions, with room to grow. This long-awaited accessory is a must-have for the dedicated Memoir '44 player. Made of classic army "olive-drab" canvas with multiple pockets - it features custom game-graphics that complement the Memoir '44 packaging, making it a snap to carry your game collection around. The Memoir '44 Campaign Bag also includes a large-scale bonus countryside map in the new BREAKTHROUGH format, plus on the reverse side, an exclusive ready-to-play battle map - Breakthrough to Gembloux! The Campaign Bag is the perfect complement to the Memoir '44 gaming experience. Double-sided BREAKTHROUGH format map. Side 1 - Countryside Map. Side 2 - Breakthrough to Gembloux Scenario. Includes both English and French text. Own any of the M44 expansions? Then get this. I suppose you could carry your game around in a shopping bag and store it on your shelves, but this makes you look cooler doing it. great quality! rugged and durable! built for battle!